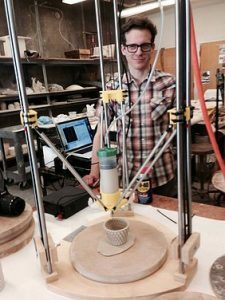 Bryan Czibesz will lead a hands-on workshop and “build-out” on Ceramic 3D Printing on February 15 and 16 on The University of Alabama campus. Two 3D printers will be constructed during his visit. In his artist statement, Bryan Czibesz writes that he is an artist grounded in the tradition of object making who asks questions of authorship and authenticity through varying degrees of engagement and dislocation between the hand and material manipulation. Czibesz earned his MFA from San Diego State University and his BA from Humboldt State University, and has shown his work in solo and group exhibitions throughout the United States and internationally, including the Houston Center for Contemporary Craft, The Center for Craft, Creativity & Design, the Riga Porcelain Museum in Latvia, and the Ceramics Annual at Scripps College. He has taught at Arcadia University, Rowan University and has been Artist-in-Residence at The Clay Studio in Philadelphia, the International Ceramics Studio in Kecskemét, Hungary, c.r.e.t.a. Rome and the University of Hawaii at Manoa. He is currently Assistant Professor of Art in Ceramics at SUNY New Paltz. His website is here. The workshop will be held in Bureau of Mines Building #5. For more information, contact Assistant Professor Matt Mitros: matthew.t.mitros@ua.edu; or phone: (205) 348-1889. Image credit: c.r.e.t.a. February 15 9:00 a.m. – 5:00 p.m.
February 16 9:00 a.m. – 5:00 p.m.
Bryan Czibesz’s visit is made possible with support from the Office of the Dean of the College of Arts and Sciences, Crimson Clay student organization and start-up funds from Assistant Professor Matt Mitros. For more information about the programs in the UA Department of Art and Art History, start here: http://art.ua.edu/about/prospective/; or call our offices at (205) 348-5967.